The final day of our visit began with a visit to SM18 - the magnetic dipole manufacture and test facility. The 27 km long LHC ring at CERN is made up from over 1200 individual dipoles. Every dipole section contains the two proton beams, each of which is surrounded by super-conducting magnets used to change the direction of the protons, ensuring that they follow a curved path around the ring. 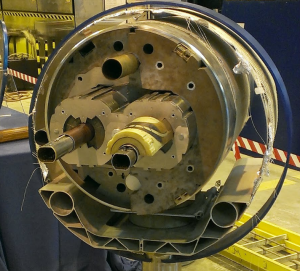 In order to maintain the very low temperatures (about 2K, or -271°C) required to keep the magnet coils superconducting the whole assembly is cooled by liquified helium. At this temperature helium becomes a superfluid, which allows it flows through the system without the need for a pump. 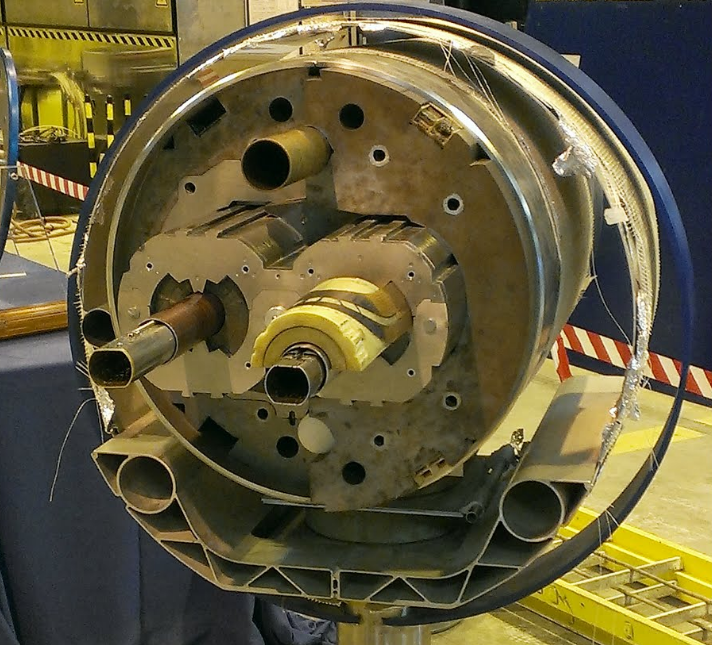 The whole assembly is insulated to keep the interior at the extremely low temperatures required, whilst the vessels containing the proton beams are maintained at almost perfect vacuum conditions. The protons themselves are essentially the only matter inside these vessels, making these emptier than interstellar space. Our final visit took us to the Large Hadron Collider 'Beauty' experiment (LHCb) to meet with Stephen Ogilvy and John Beddow, two PhD students from Glasgow University. 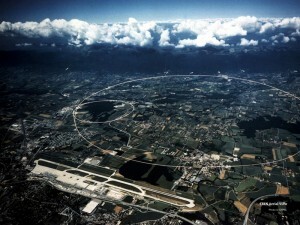 The LHCb experiment was built to investigate the differences between matter and antimatter and was designed to study a type of particle called the "beauty quark", or "b quark". Unlike the ATLAS and CMS experiments, which collect data in all directions around the point of collision between protons, LHCb uses to detect particles thrown forward in a single direction from the point of collision. 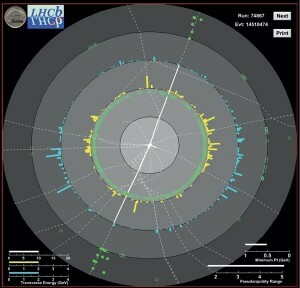 Using layers of sub detectors, the short lived quarks can be detected before decaying into other forms. Stephen and John gave us an overview of the operation of the experiment, and of the underlying physics behind a number of the individual detectors. They also spent some time speaking to the group about their experiences of studying physics both as undergraduates (in Manchester) and as post graduates undertaking research towards PhD theses at Glasgow. As this was the last stop on our tour, on the last day of our visit, our next journey was the short bus ride back to Geneva airport for the flight home. At the airport Rebecca asked the group to record their thoughts about their visit. Having been asked for 'a few words' all of the students wrote extensively about their experiences, many using words like 'incredible', 'amazing' and 'inspiring'. They were also keen to express their gratitude for being given the opportunity to come on the trip. Having been a high school physics teacher since 1995, I have been fortunate to participate in a number of school excursions, including a few physics based trips and a few overseas visits. This trip, without a doubt, is the best I have ever been on, with three days packed full of incredible experiences, in a truly awe-inspiring place, meeting fascinating, enthusiastic and generous people, who did so much to make our visit a huge success. None of this would have happened without the support of Glasgow University (especially Aidan Robson, who made all the arrangements), the Ogden Trust, Mick Storr at CERN, Science Connects (Rebecca Crawford, who invited me to come along)and the Scottish Universities Environmental Research Centre. It is possible to visit CERN as a member of the public, as part of a school trip, or on an organised commercial tour, but our group were lucky to have a mixture of experiences and contact with scientists that are not available to very many other groups. A number of Scottish schools run their own trips to CERN, and many of the teachers organising these trips have been good enough to share their experiences and advice with others via the Institute of Physics (IOP) email forum for physics teachers, SPUTNIK, and on the resource sharing network sptr.net. Over the coming weeks and months, I hope to arrange a return trip to CERN using my experiences of this visit, and those shared by others across the country. I also hope to encourage some of my senior pupils to undertake a large part of the organisation of such a trip, perhaps even seeking sponsorship to support the students involved. When it all happens, we will be sure to blog about our experiences.